In the word right, you will find Jesus Christ, as in the right way, righteousness, one’s rights, and the right hand, a right spirit, the right hand of power, and so on. It’s the 180 Principle—the opposites. A circle has 360° and at 180°, you find the opposites. God is light; Satan is darkness. God is salvation; Satan is damnation. God is love; Satan is hate. God is life; Satan is death. And so on. The opposites. Today, you can be a brand-new, perfect creature, but to find your life, you must lose it. Click onto “Further With Jesus” for childlike instructions and immediate entry into the Kingdom of God. NOW FOR TODAY’S SUBJECT. MAN SAID: Prove that the God of the Bible is. Prove it! I want proof! Now THE RECORD. Welcome to GodSaidManSaid feature article 696 that will once again prove the full inerrancy of the Holy Bible. All of these features are archived here in text and streaming audio for your edification and as fishing bait for the lost souls of men. Every Thursday eve, God willing, they grow by one. May God’s face shine upon you with Light and Truth. 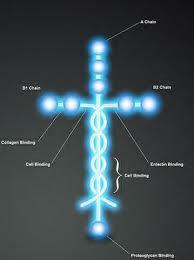 Jesus Christ is the center of our molecular structure. No discovery, scientific or otherwise, will ever controvert this truth. God is such a marvelous master of detail. His forethought and handiwork is glorious to behold. Keep in mind as we continue that God created all things by Christ Jesus and that He knows the end from the beginning. Laminins are major proteins in the basal lamina (one of the layers of the basement membrane), a protein network foundation for most cells and organs. The laminins are an important and biologically active part of the basal lamina, influencing cell differentiation, migration, adhesion, as well as phenotype and survival. Laminins are trimeric proteins that contain an a-chain, a b-chain, and a g-chain, found in five, four, and three genetic variants, respectively. The trimeric proteins intersect to form a cross-like structure that can bind to other cell membrane and extracellular matrix molecules. The three shorter arms are particularly good at binding to other laminin molecules, which allows them to form sheets. The long arm is capable of binding to cells, which helps anchor organized tissue cells to the membrane. The laminins are a family of glycoproteins that are an integral part of the structural scaffolding in almost every tissue of an organism. They are secreted and incorporated into cell-associated extracellular matrices. Is that which holds life together. It was a shock to scientists when they discovered the instructions of life found in DNA are made up of a four-letter alphabet structured in words, sentences, paragraphs, chapters, and volumes. God said He spoke everything into existence with words, and the proof is everywhere—even on the cellular level—to those who choose to see. 1 The heavens declare the glory of God; and the firmament showeth his handiwork. 2 Day unto day uttereth speech, and night unto night showeth knowledge. God is light. We see God with our eyes. Job speaks in Job 27:3: “…and the spirit of God is in my nostrils.” Looking for God? Breathe deep.